Can a proper noble lady find a future with a fossil-hunting man of faith? As the daughter of Viscount Aynsley, Caroline Hatherleigh knows every rule of society–and she’s always followed them precisely. But when she visits south Devonshire and encounters a fossil-hunting scientist and his sister, her assumptions about what is right are shaken. Questions she has never considered about the importance of friendship and faith suddenly confront her–and her comfortable understanding about how the world works is thrown off balance. What if God wants to be the center of her life, rather than merely a social obligation? Gideon Kirby loves science, and hunting down proof of past lives is a joy he won’t willingly give up. But his scientific leanings are being challenged both by his personal beliefs and by local smugglers in the Devonshire countryside. And every day his sister’s illness becomes more desperate, her care growing more demanding. Adding a viscount’s daughter to the mix is a complication Gideon never expected–especially since he must stay far away from this young woman he’s falling for in order to protect his beloved sister’s secret. When a mysterious stranger visits the village, that secret will be exposed, no matter how Gideon fights. Then tragedy strikes in a smugglers’ cave. And the threat of scandal may lead to broken hearts and passionless propriety. Will the shaky bond these two have nurtured be strong enough to overcome their differences–or will the trust they’ve withheld from each other tear three lives apart? Carolyn Miller lives in New South Wales, Australia with her husband and four children. A longtime lover of Regency romance, Carolyn’s previous novels have won several contests, including the 2014 RWA “Touched by Love” and 2014 ACFW Gensis contests. She is a member of American Christian Fiction Writers and My Book Therapy. I have read and enjoyed every novel that Carolyn Miller has penned. With each novel I think, “Aw, this is her best book yet!” Carolyn Miller could not write a bad book if she tried. She is a truly gifted storyteller. A Hero for Miss Hatherleigh is a beautiful Regency-era story. The plot is highly engrossing — so much so I read way past my bedtime two nights in a row. The characters are wonderfully crafted and so realistic. And, the themes discussed throughout this book are timely. A Hero for Miss Hatherleigh is definitely a 2019 must read, especially if you love Regency-era stories. At the start of this novel, Caroline Hatherleigh is not a believer in Christ. She is a product of her exceptionally wealthy society, and is her own god. I won’t lie — she bugged me so hard! I found her to be selfish, self-centered, and I could not stand how she initially treats others. But I didn’t give up on her. Through no fault of her own, Caroline is momentarily expelled from her society and sent to her grandmother’s house in the Devonshire countryside. It is during her exile that she meets Mr. Kirby, his sister Emma, and their good friend Mr. Kenmore. Kirby, Emma, and Kenmore all deeply love and respect God; it is evident in their words and actions. At first, Caroline struggles with the notion of believing in an “invisible being,” and finds their faith strange. But slowly she transforms and comes to understand God’s Truth. She also realizes how awful she’s been to others, and longs to be a better woman. I found Caroline’s transformation to be realistic and satisfying, and I could not help cheering for her. By the end of the story, Caroline completely endeared herself to my heart and she became my favorite character. One of my greatest downfalls is that I judge others. It’s so ingrained in me, I don’t even realize I am doing it. A Hero for Miss Hatherleigh convicted me mightily. For 20 chapters, I disliked Caroline. I found myself thinking, “If she were real, I wouldn’t want anything to do with her.” At one point, I stopped and analyzed why I disliked a fake person so much, and realized it’s because she didn’t love God. Instead of being gracious and understanding of her background, I just refused to like her. When this understanding dawned on me I got really sad. What an awful christian I am. How can I be the Christian Fiction Girl and have such an ugly, rock-hard heart? Over time, I have convinced myself that my hours of study and prayer have made me better than those who are not christian. I didn’t even realize I was doing this. A Hero for Miss Hatherleigh really held a mirror to me and showed me that my Pride has taken great hold of me. I am so grateful and truly blessed to have read this wonderful story. I know I have a lot of work and prayer to do to fix myself (with God’s help, mercy, and forgiveness), but at least now it’s not too late. God has given me more time to work on becoming the woman He wants me to be. What a loving God we serve — He met me where I’m at in the pages of a beautifully crafted novel! 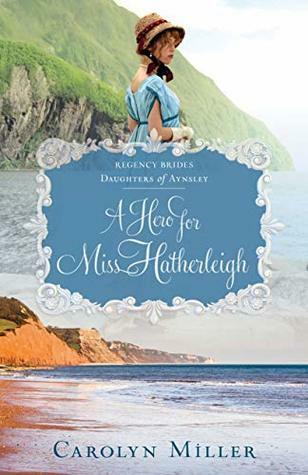 A Hero for Miss Hatherleigh is a wonderful story filled with endearing characters, fascinating seaside settings, a dash of danger, and lovely romance. I truly cannot recommend this book enough. If you are a fan of excellent writing and fantastic storytelling, and you love a good, clean romance with timely themes, then this is definitely the book for you! I received a review copy of this novel in paperback form from the author via her publisher, Kregel Publications. In no way has this influenced my review. The opinions expressed in this review are my own. I am giving away ONE (1) paperback copy of A Hero for Miss Hatherleigh by Carolyn Miller. The giveaway begins today, 3-19-19 at 5:00 am (PST) and ends on Saturday, 3-23-19 at 12:00 pm (PST). To enter, click on the Rafflecopter link below. Good luck! YOU HAVE WON THIS GIVEAWAY. THANK YOU FOR YOUR PARTICIPATION. ***Please Note: Open to Continental U.S. mailing addresses only. *** One winner will be notified via email at the end of the giveaway, and will be announced here on this page. For full giveaway disclosures and policies, click HERE. I have enjoyed reading her books. Carolyn Miller is a new-to-me author; however, this book looks like something I definitely would be interested in! Thanks for the wonderful review and opportunity to enter a giveaway! Would love to win a print copy! God bless! Carolyn’s books are awesome. You will love her stories. On a side note, Lual, you won one of my Of Fire and Lions copies by Mesu Andrews. I emailed you, but I’m guessing it didn’t go through. I’m going to email you right now. This sounds so good! Regency isn’t my favorite era, and I haven’t read any of Carolyn Miller’s other books, but I think I’ll have to take a chance on this! Carolyn’s books are really good. Very engaging and sweet. Also very clean and respectful. I have not read any of Carolyn’s amazing books yet? I love this time period — it’s so Jane Austen. This has a beautiful cover! I’m part of Mesu’s BFF Team!! !